SwissDecTX Transmitter 4.0 (Swissdec ELM Transmitter 4) Certifiable, secure Swissdec 4.0 ELM Salary Data Transmitter as a ready-to-use prepackaged component, callable directly from your application. Below are screen shots of the SwissDecTX 4.02 Configuration & Test tool that is included with the SwissDecTX distribution. 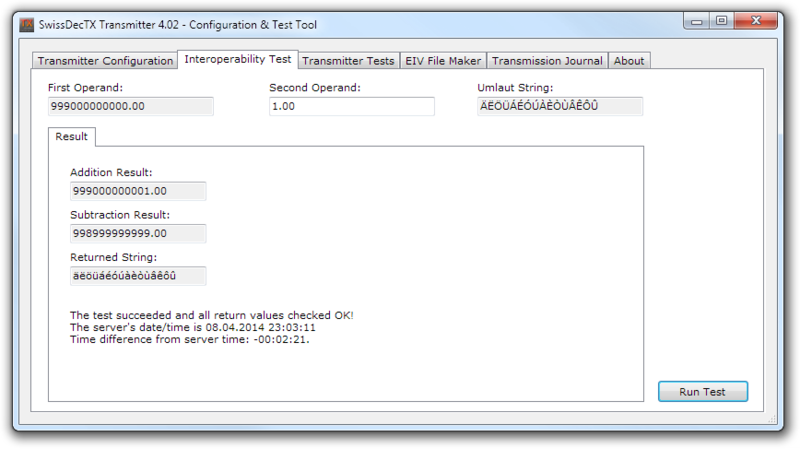 This tool can be used to configure the transmitter as well as perform the interoperability tests required by SwissDec. The tool can also be used to verify the functions of the transmitter and to administrate the automatic transmission journal. The transmitter itself is a component that you application calls, it has no user interface. 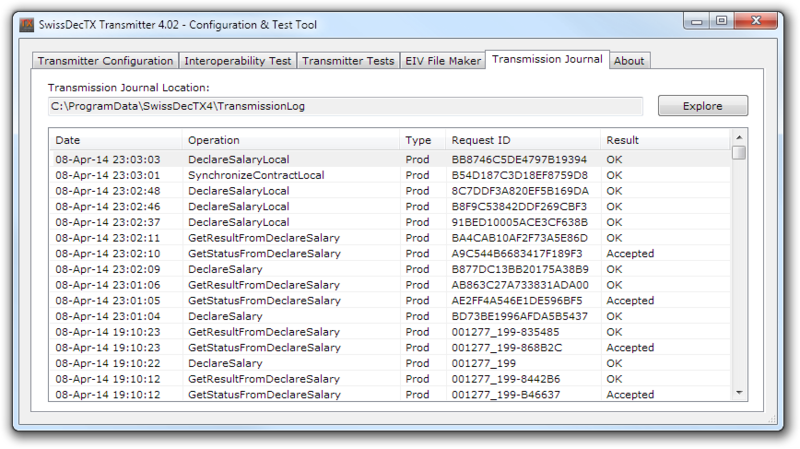 You application can rely on the Test & Configuration tool for interoperability testing, EV file generation and transmission journal: tou do not need to implement these features in tour application! The results of the transmission tests demostrate the built-in XML-to-HTML transformations. Your application can benefit from the same feature and get the same ready-to-display HTML out of the trasnmitter in a single function call. This feature alone saves you several weeks of frustrating work to decipher and format the server replies. Scroll down so have a peek at the help file, and see how we test the transmitter. You can click the images to enlarge them. 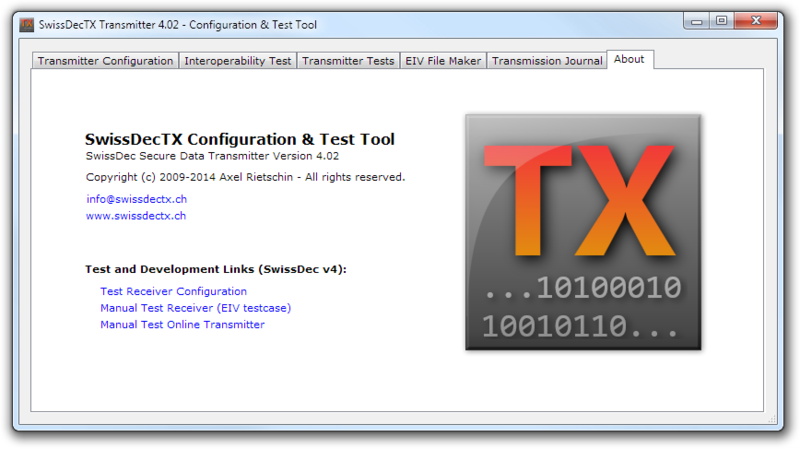 SwissDecTX Transmitter 4.02 – Configuration & Test Tool – Main configuration page. 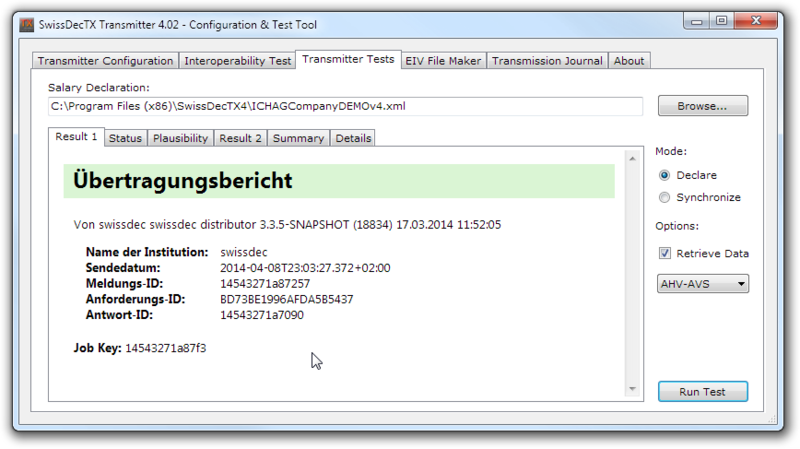 SwissDecTX Transmitter 4.02 – Configuration & Test Tool – Interoperability test (suitable for the SwissDec 4 certification: no need to implement this test in your application). 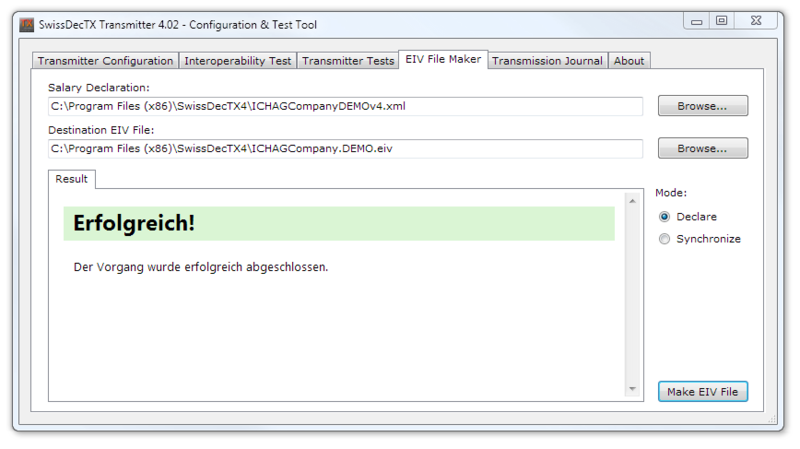 SwissDecTX Transmitter 4.02 – Configuration & Test Tool – Transmission tests & results. Note the perfect formatting of the replies in HTML format: the transformation from XML to HTML is part of the transmitter and is available to your application! 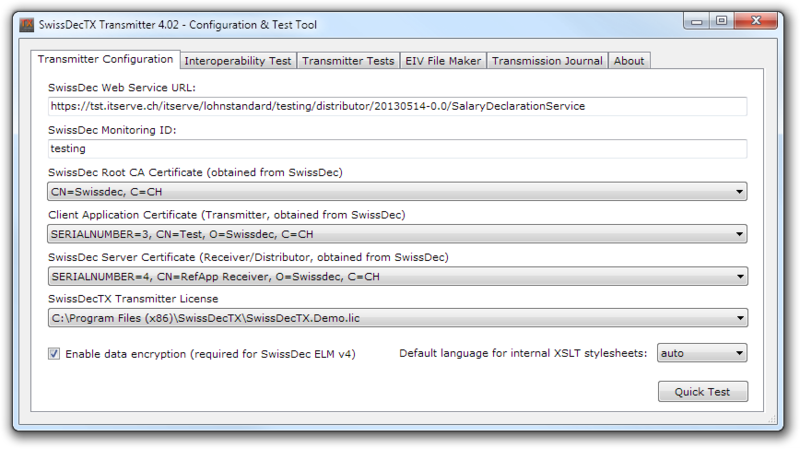 SwissDecTX Transmitter 4.02 – Configuration & Test Tool – Create signed XML declarations locally for manual transmission. SwissDecTX Transmitter 4.02 – Configuration & Test Tool – Built-in transmission journal (suitable for the SwissDec 4 certification: you are not required to implement your own transmission journal). SwissDecTX Transmitter 4.02 – Configuration & Test Tool – Information page with helpful links to the SwissDec test servers configuration. 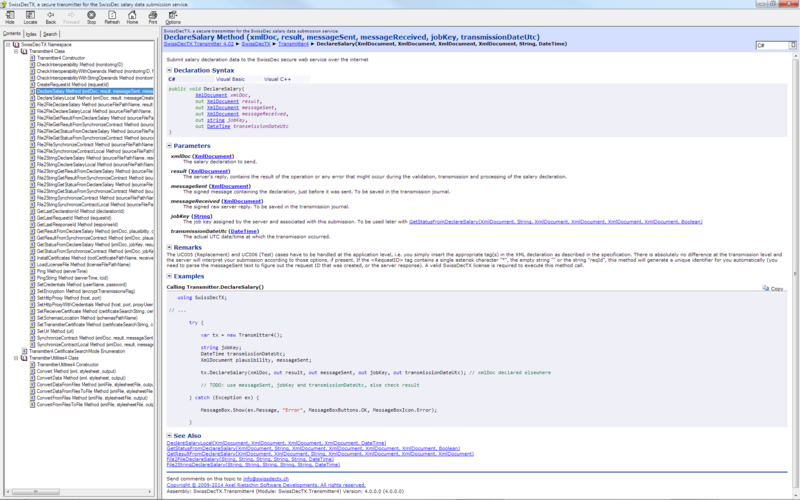 Screenshot of the programmer’s help file (API documentation) – Just one page of the extensive commercial-grade documentation supplied with the transmitter. Note the code sample and the parameter descriptions, the remarks and the see-also links: developing with the SwissDecTX transmitter is a great experience and programmers get results quickly. The transmitter can be called from C# / VB.NET directly, or as an ActiveX object from VB/VBA/Delphi etc, or using a C/C++ style DLL, or through a command-line tool, all of which exposing the same uniform interface. We support all development environments and tools either directly or indirectly. Systems not running Windows at all can still transmit provided they can read and write files, thanks to our gateway add-in. Send us mail at info [at] SwissDecTX [dot] ch if you have any question about the transmitter’s integration. 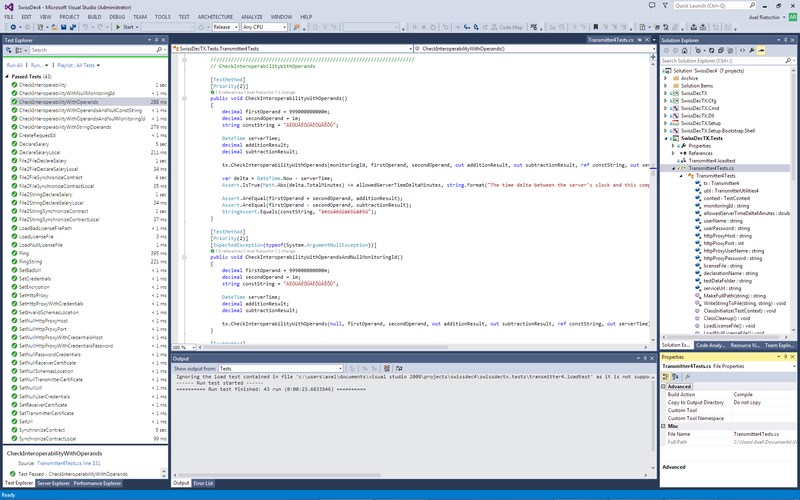 World-class automated 100% coverage testing of the SwissDecTX 4 transmitter in Microsoft Visual Studio. Note our beautiful test code, and the sheer number of automated tests we run with every build. The SwissDecTX transmitter is a fully professionally developed and maintained component with proven industrial-strength reliability.